Well, I have arrived in Seattle safe and sound for the 141st annual meeting of the American Fisheries Society (AFS). If you can believe it, fisheries scientists having met every single year since just after the end of the Civil War, and today I have become a participant in that long tradition. This is by far the largest conference I have ever attended, with over 4600 people registered, 2000 of which are giving talks and another 500 of which presented posters this (Monday) evening. I flew into Seattle yesterday morning and was immediately impressed with their public transportation - something akin to Calgary's C-train picked me up at the airport and, for a mere $2.75, ushered me for the 40-minute ride downtown. I didn't even need to wait for the train - they leave something like every ten minutes. I arrived at the hotel (the Red Lion, definitely one of the nicer hotels I've been in, although its toilet makes strange dripping sounds all night due to the water saver installed in the back of it. It has, however, committed the unforgivable sin of not providing a continental breakfast. Or of having a hot tub). I was way too early for check-in, so I dropped my luggage off with the bellhop and then headed downtown. I left my camera in Calgary by accident, so I will have to steal pictures from Google. Seattle has a pretty decent downtown, quite well kept. Its rather upscale (I passed a Gucci and a Louis Vuitton not too far from my hotel), which makes the appalling level of poverty so very striking. I have passed an untold number of homeless in my wanderings, way more than I have ever seen in Calgary or Hamilton. I have yet to see any shelters, but I'm sure there must be some somewhere. Seattle, I read somewhere, is one of the most underchurched cities in North America, however, and since the churches often play a large role in establishing shelters, I do wonder. My first visit was the Washington State Convention Center, which was absolutely huge, and was where the main part of the conference was being held. I registered and got my swag (a sweet bag with the AFS meeting logo on it - note the striking native artwork (left)), including a steel water bottle, some tree seeds, and a strange fish drawn on a plastic sheet that is supposed to tell me my mood. It told me I was a dead fish. I don't think it works. After an amazing lunch from a stone-fired pizza street vendor, I headed on down to Pike Place Market, which totally blew me away. Organic fruits, hand-made crafts (including replica weapons for the Legend of Zelda games), book stores, buskers and a giant fish market where vendors threw around massive halibut fillets to the joy of the crowd, were all compressed into a tiny, outdoor-indoor-underground celebration of Seattle culture along the waterfront. After a few hours there, I wandered on down to the Seattle Art Museum, where I spent a highly entertaining, and fairly cheap, 2.5 hours. By the end, however, I was too exhausted to go on, and had to skip over the Native American exhibit. There was plenty to see there, including artwork from ancient Greece, Egypt, Renaissance Italy and the like. But there were two rooms that struck me the most. The first was the abstract expressionist room. The paintings there, to my mind, were almost all giant pieces of garbage that meant nothing to no one, and had made money by virtue of art critics being idiots. I mean, there was one where a guy had glued a ladder to a canvas and splashed paint all around it, and then stuck a tie at the bottom. What is that? 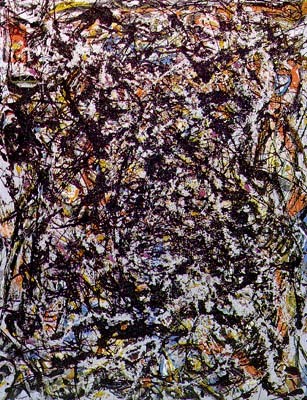 However, my initial disgust was overcome when I saw Jackson Pollock's Sea Change (1947) and Mark Rothko's #10 (1950). The images below really do not do them justice; there is definitely something about seeing the size and presence of the real thing. Pollock's painting is the only one I came back to at the end of the day; Rothko's, on the other side of the room, I had ignored the first time, but it kept catching my eye as I looked at Pollock. I can't tell you what grabbed me about either of them. But I see why people pay money for them. The New Objectivity room was by far my favourite room, because it was hilarious. Artists revolted from the crazy expressionists, and they revolted by making their art as absolutely literal and objective as possible. So one painting was an empty canvas with a thick black border around it, and then a thin yellow border on the inside of that one. That was it. That is art you can't argue with, because there is nothing there. A guy sat at a chair for at least twenty minutes, staring at that painting and taking notes. There was another one that wasn't even a painting. It was a wall sculpture by Robert Morris. It was literally a sheet of metal with the words Ceiling, Wall, Wall, and Floor written on its four sides, and an arrow pointing to the respective location. Numbers corresponding to the distance to each of these spots were next to the words, and they could be changed to conform to whatever the reality was of the gallery it was in. That one was awesome. A big giant slap in the face to guy-who-puts-ladder-on-canvas. Some other items of note included the sculpture Mann und Maus by Katharina Fritsch, of a giant black mouse sitting on a person lying in bed; the postmodern Artists and Actors, by David Salle, and the strangely beautiful sculpture Some/One by Do-Ho Suh. Anyways, it was by then time for the start of the conference, so I hurried on down to the Sheraton Hotel for the Welcome to Seattle ball, where I experienced live music, delicious food from a world-renowned sustainable-cooking chef, and the irony of being presented numerous sea food items (unhelpfully labelled 'salmon' - what kind of salmon, people!?! I expected better from fisheries scientists!) right next to a table loaded with books for sale about the decline of commercial fish species. I Google Imaged "Artists and Actors Salle", and up popped numerous pictures of ER's Eriq La Salle. Even as a child, Eriq La Salle was one of my least favourite actors. I hope David Salle is better. PS- this makes me want to visit Seattle, and bring a few extra meals for homeless people.